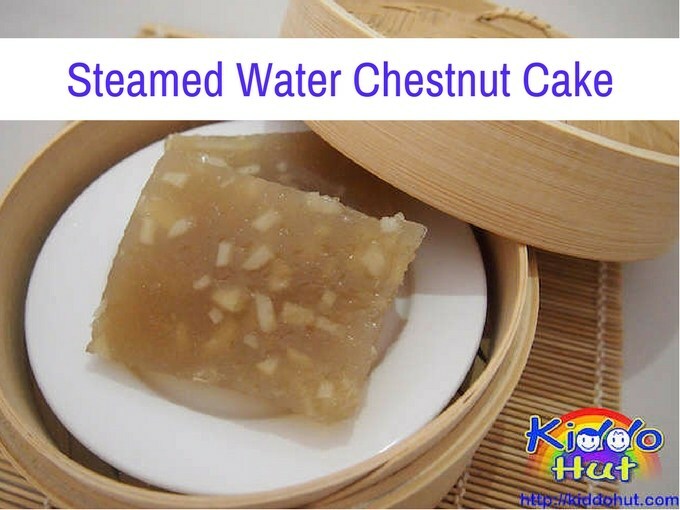 Steamed water chestnut cake (蒸马蹄糕) is one of the dim-sum dishes, but not all Chinese restaurants in Singapore that serve dim-sum have this dish. In fact, it is a popular yet uncommon dish. I am not sure why but this is an easy dish to make. Water Chestnut is commonly known to have cooling effect and especially taste refreshing during warm weather. The crunchy texture of the water chestnut in the soft steamed cake is perfect to our taste buds. We have been on this dim-sum craze recently, going for dim-sum almost every week. Suddenly, my husband made this request – he wants to eat the steamed water chestnut cake. Hmm… alright, I haven’t made this cake for the longest time, time to fish out my recipe. And, I made this cake in the quiet midnight on a Saturday night while my tots were sleeping, without any disturbance. 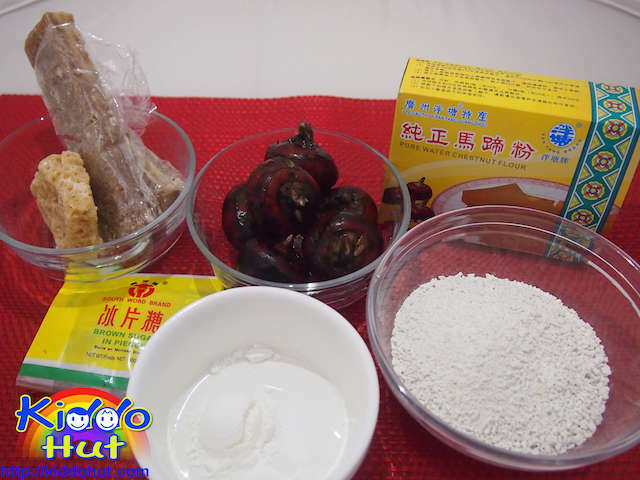 I have used the Guangzhou Pan Tang (泮塘牌) water chestnut flour. There are several brands of water chestnut flour but I haven’t used the others before. For water chestnut, some supermarkets sell the peeled water chestnut but I prefer to buy the fresh ones with skins. I think they taste better and more crunchy. Some recipes call for white sugar, but I personally find that the honey rock sugar (石蜂糖) gives a more aromatic sweetness to the cake. Similarly for the brown sugar slab (冰片糖), this is commonly used for Chinese dessert. It also adds a more brownish colour to the cake. So, depends on the colour of the cake you would like to have. If you prefer a sweeter cake, adjust the sugar accordingly. This snack is soft when you steam and turns harder when it is chilled. Frankly, both textures taste equally good. In fact, I like it chilled during warm weather. Let’s roll up our sleeves and steam this cake! 1. Grease the tin with a bit of oil. 2. 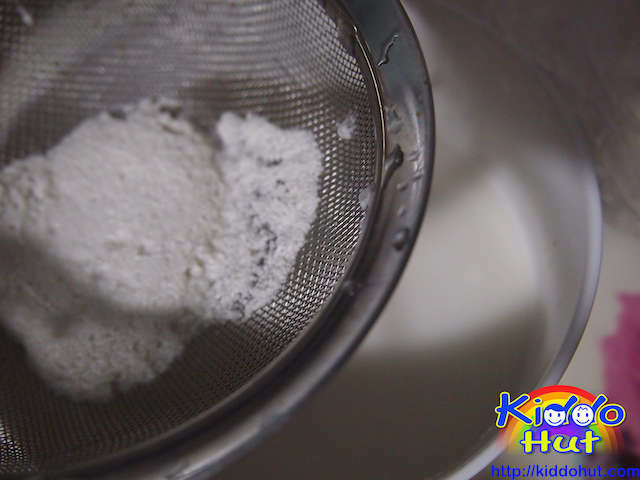 Add the water chestnut flour and corn flour to 450ml of water and stir to dissolve the flour. Drain the mixture through a fine sieve and add 3 tsp of cooking oil to the mixture. 3. 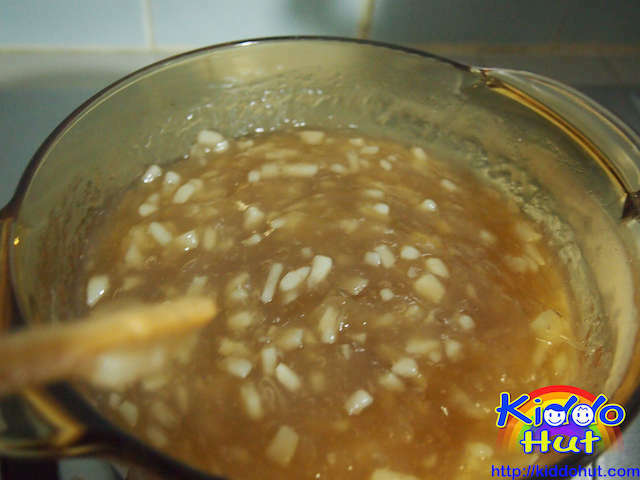 In the pot, add the honey rock sugar and cut brown sugar to 450ml of water and bring to boil. Stir to dissolve the sugar while the water is being boiled. 4. When the water is boiling, reduce the heat to low and add in the chopped water chestnut. 5. Stir in the mixture prepared earlier. Continue to stir as the whole mixture will start to turn into a thick and sticky batter, Ensure not to let the batter stick to the bottom of the pot. Keep stirring until the batter is thick and sticky. 6. Pour the batter to the greased tin. Level the surface using a spoon or spatular. 7. 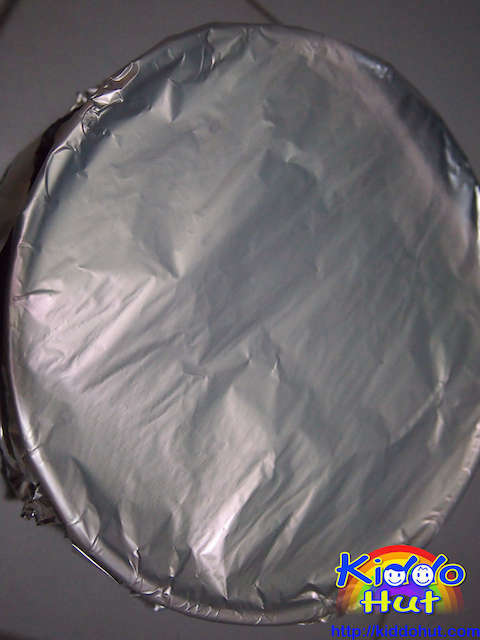 Put the tin to the steamer and steam for 40-45 minutes or until the cake turns translucent or use a toothpick to check. If the toothpick comes out clean, the cake is cooked. Test on few spots. 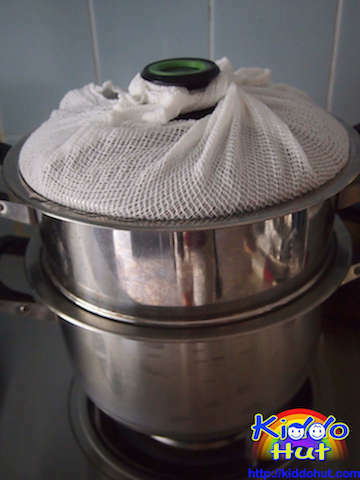 Do cover the steamer cover with the steam cloth like picture below to ensure condensed water on the cover does not drip into the cake. Alternatively, you may cover the tin with foil. 8. Let the cake cool before slice to serve. Or, you may put the cake in the fridge as it is easier to slice when chilled. You may warm it by steaming or pan-fry or serve cold. If you have enjoyed reading this article, do like my Facebook page to get more upcoming fun and informative articles. You can also follow me on Twitter (@KiddoHut), Pinterest (@KiddoHut), Google+ (@KiddoHut) and StumbleUpon (@ Kiddo Hut) for more updates. Thank you for visiting Kiddo Hut! I miss eating them! Need to learn and make it!